Lock in a great price for Motel One Berlin-Hauptbahnhof – rated 8.9 by recent guests! Breakfast was surprisingly good... We lived the vegan/vegetarian options. As a suggestion we would like to have eggs from free chickens and oat milk. The staff was perfect. Fantastic location close to the main train station, helpful staff, clean room, wifi works perfectly. Will stay here again. The location is awesome, kitty corner from Berlin central. It’s not the busiest part of town, for more lively night life u prob will have to stay in Alexanderplatz or Tiergarten area. U can walk to Brandenburg gate or take U55. The room isn’t huge but big enough, with cubbies and rod to hang coats. Our room was on the 10th floor and it’s not fronting the main Street, so not the best view but it’s quiet. The hotel has lots of business travelers. The rooms are exceptionally clean and well designed. Plugs next to the bed. The bathroom looked very new and has a great shower. The shampoo is really nice. The breakfast is basic but has everything you need and its very good value for the money. Overall, don't expect a 5* hotel, but for the price Motel One is a good choice. The hotel is centrally located next to the railway station and TXL bus. The staff was very friendly and helpful. We got a very nice room. The bathroom was large and very modern. Motel One had a modern simple design and I was comfortable to stay on my own. The cleanliness was above my expectation and the staff were very efficient. Everything was perfect. Good staff and very helpful, clean room and great location. I got the room on 3rd floor and facing to the main street, but it was very quiet. The tram stop just opposite to the hotel. I will stay here again if I come back to Berlin. Location in front of the station, very comfortable for us to walk or took a tram/bus to all the history sites in Berlin. Staffs are very helpful and fast response. We got a room with a view to the park so we always got a fresh air in the morning. Check out is very generous, 12 PM, not like any other hotels in Europe. Motel One Berlin-Hauptbahnhof This rating is a reflection of how the property compares to the industry standard when it comes to price, facilities and services available. It's based on a self-evaluation by the property. Use this rating to help choose your stay! 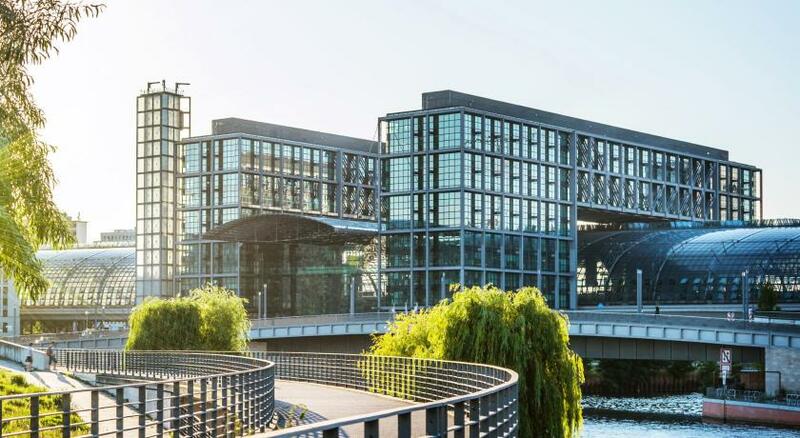 The Reichstag parliament building is only half a mile from the Berlin-Hauptbahnhof Motel One. S-Bahn trains run from Berlin Central Station to Alexanderplatz square in 7 minutes. When would you like to stay at Motel One Berlin-Hauptbahnhof? Located on the 11th floor, this spacious room includes a balcony. House Rules Motel One Berlin-Hauptbahnhof takes special requests – add in the next step! Motel One Berlin-Hauptbahnhof accepts these cards and reserves the right to temporarily hold an amount prior to arrival. Guests traveling with children are kindly asked to contact the property in advance. Please note that children can only be accommodated upon request, subject to availability. We checked in the hotel at 15:30 and our room was not ready. The receptionist said he will contact the room service and asked me to wait for the answer. He did not come back to us 10 min later. Clean. Walking distance to Berlin Hauptbanhof. Staff are helpful. Everything! Nice, modern, clean and comfortable . Good bedding. Free WiFi. Excellent location. Very friendly and professional staff. The hot water from my shower was not stable, having cold water from time to time. Very convenient and well located for where I needed to be as I was managing an event at the Bollé Festsale - literally a 15 minute walk away. Everything worked and was clean - Shower was excellent! The room was simple but clean and cozy. When I went to check out in the morning, one of the staffs was waiting for us to collect the room key near the exit, so check-out process was extremely smooth. The location cannot be better; just cross the road from the central station. Also several buses and trams run from the side. It depends on where you go, but, for example, to Potsdamer Platz I could take the bus from the busstop less than 5-min walk away without going into the huge central station! Would like to stay here again!